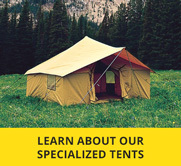 Kenai tents provide the same easy set-up as our spike tents. They are the frequent choice of many outdoor enthusiasts, because they meet expanded size requirements. 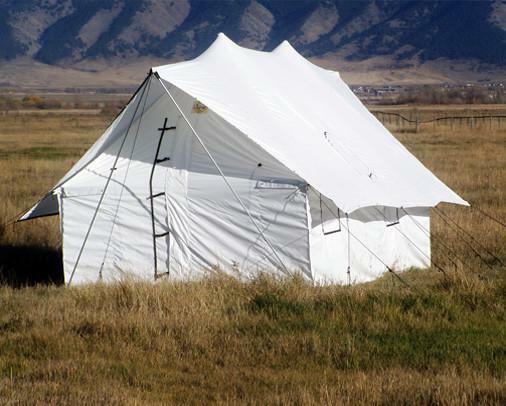 Please note the type of material you would like at checkout, standard will be a Tan Relite tent. Montana Canvas uses a grade-A, cotton duck canvas and 250D Relite Polyester Fabric. Treatment is applied at a USA finishing plant. 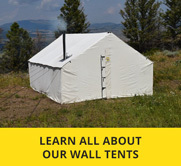 This gives you a treated material that is fire-retardant to California Marshall fire specifications with water-proofing and mildew inhibitors. Available in 10oz canvas, Montana Blend or Tan Relite. Please specify which fabric you would like. Please note at checkout if you would like a 4″, 5″, 6″ or no stovejack with flap. If not noted, a standard 5″ stovejack will be added.